Totally Severe's stitching is AMAZING! 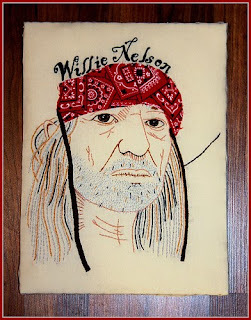 But I also saw my all time favorite musician in the world, Willie Nelson-the red headed stranger. Those are amazing! I'm happy if I can stitch a flower and it doesn't look like The Blob! I absolutely adore Amy Winehouse.. seeing her stitched up all pretty makes my knee's week! Totally LOVE the birds in the hair... hummm where's my needle!!! 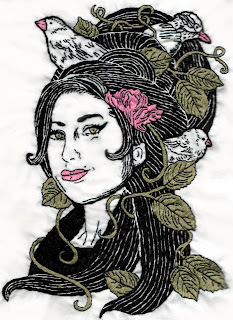 I thought the Amy Winehouse one was a block print! Beautiful! Brilliant, what talent! It must take lots of patience to do. wow these are both fantastic!